On February 17th, John McCain was in Germany at the Munich Conference. He gave interviews with the press, insinuating that President Trump was dictator-like and hindering the free press. The media then ran with the false 'dictator' story for days, and ignored the fact that immediately following McCain’s “dictator” comment, he made an illegal trip into Syria. Was McCain’s dictator comment purposeful, to veer the media away from his illegal trip to Syria? Every time McCain has made a trip to Libya or Syria he has always met with members of Muslim Brotherhood or al-Qaeda (most of whom later became members of ISIS). One must wonder, has our Intelligence become so incompetent that they don't know who is who in the terrorist world? Or was McCain a purposeful means of spreading deception, and thereby promoting the expansion of the Islamist Agenda in Libya, Egypt and Syria. I can remember in 2011 watching the news on Egyptian TV. There on our TV screen was John McCain in Libya. Video showed him smiling for the cameras with well-known Muslim Brotherhood and al-Qaeda members. I remember my husband and I gasping in disbelief and my husband saying to me: "Why is he with the Muslim Brotherhood?" But an even better question is, why is McCain always with group leaders whose sole purpose and goals have been the enforcement of Islamic Law in Libya, Egypt and Syria? If it was apparent to all of us regular folk here in Egypt, why didn't U.S. Intel know who these people were? Or did they know–and McCain is part of this deception? I don’t know the answer to that, but I do know that the people McCain has met with in Libya and in Syria are known terrorists who enforce Islamic Law on people who do not want to be governed by Islamic Law. These people McCain supports openly declared in 2011 that they wanted Islamic Law enforced in Egypt, Libya, Iraq and Syria. They were not for “democracy”. Wouldn’t McCain have known that? Everyone in the region knew, where was U.S. Intel? In May of 2013, McCain showed up again on our TV news. This time with members of the Islamist group who were responsible for kidnapping eleven people in Azaz, Syria and who handed the victims over to al-Qaeda in Syria (known as al-Nusra). These people McCain met with were also responsible for kidnapping Steven Sotloff and who handed him over to ISIS, who then beheaded Sotloff. The group who conducted the kidnappings, the "Northern Storm" brigade, was a brigade of the "Free Syrian Army". When the "Free Syrian Army" was created in 2011, it started with two brigades: the Farouq and the ibn Walid. The ibn Walid was funded and armed by the Egyptian Muslim Brotherhood. The Farouq was funded and armed by Saudi Arabia and its members were al-Qaeda. The Farouq brigade often joined forces with al-Qaeda in Syria (aka al-Nusra) to massacre minority groups. Towards the end of 2011, an additional brigade was formed, the Northern Storm. It controlled northwest Syria and its headquarters was in Azaz, near the Turkish border. 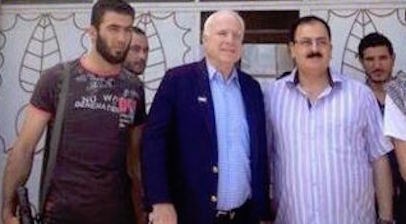 McCain’s meeting with the Free Syrian Army’s Northern Storm brigade in 2013 was videotaped and showed McCain with Abu Ibrahim and Muhammad Nur. After forming the brigade in 2011, Abu Ibrahim ordered his jihadists to dig a giant pit in the ground, and he used the pit as a prison for anyone opposing the Free Syrian Army’s goals or opposing Islamic Law. Abu Ibrahim also immediately formed an Islamic Law courtroom in which became the government for northwestern Syria. The hospital in Azaz, where Northern Storm had its headquarters, had just been renovated and supplied with the latest medical equipment at a cost of more than one billion Syrian pounds. Abu Ibrahim captured the hospital, looted it and sold all of the equipment to buy weapons. All of the doctors were put in the pit. These are the men McCain met with. By the end of August 2012, the Free Syrian Army had its own “mini state” in northwestern Syria after capturing most of the towns in the region. The Northern Storm brigade targeted Alewite villages--massacring entire villages. By murdering civilians and capturing their towns, they were able to take control of the Border Crossing at Bab al-Salam. From that point on, in 2012, the Free Syrian Army only allowed journalists, politicians and financiers into Syria who were supportive of taking down the current government and replacing it with an Islamic one. McCain crossed illegally into Syria in 2013 at Bab al-Salam, which was controlled by the Free Syrian Army. There, at their Azaz headquarters, McCain met with Abu Ibrahim, the man who placed people into a pit and where he ran the region by Islamic Law. McCain also met with Muhammed Nur, chief press spokesman for the brigade (Nur later became the Islamic State’s press agent). You would think that U.S. Intel would have known what was going on in northwestern Syria: the massacres, the kidnappings, and even the giant pit. We did. Newspapers and television networks in the region reported the atrocities, complete with videos and witness testimony. How is it that these ships were ready and waiting for the "refugees"? The “refugees” were then shuffled onto trains and buses, which were also organized and waiting, and which took the “refugees” into Germany, France and elsewhere into Europe. Who paid for those ships, trains and buses, and who organized this enormous movement of refugees? And who did they let “out” of Syria at the Bab al-Salam border crossing? Christians? or the other persecuted minority groups, such as Alewites, who were being massacred by the people McCain was meeting with? No, only radicalized Muslims were being allowed to cross the border out of Syria as "refugees". In 2013, right before McCain’s visit, the (real) Syrian Army was winning the battle against the Islamist takeover. In order to reverse this, the Free Syrian Army and al-Qaeda in Syria (aka al-Nusra) needed an "intervention" by the West that would assist their armies. McCain met with and supported the very group who killed those children. Did McCain identify the right people? Three months after McCain's meeting with the Free Syrian Army's Northern Storm brigade, Northern Storm kidnapped journalist Steven Sotloff and sold him to the Islamic State. The Islamic State beheaded Steven Sotloff. Steven Sotloff had reported in Time Magazine that al-Qaeda fighters from Libya were gathering in large numbers and moving to Syria and were shipping arms from Libya to Syria to arm the al-Qaeda groups in Syria. In 2011, McCain met with Muslim Brotherhood and al-Qaeda members who created the Free Syrian Army and who conducted massacres on Christian villages and who massacred Alewite children in northern Syria. McCain has met with al-Qaeda members who became the Islamic State's Caliph, abu Bakr al-Baghadid, and the Islamic State’s chief press agent, Muhammad Nur. McCain met with the vicious terrorist abu Ibrahim who enforced Islamic Law in northwest Syria, threw people in pits, and who controlled the Syrian-Turkish border at Bab al-Salam. Who promotes the propaganda that McCain spews? Who defends McCain's meetings with Muslim Brotherhood, al-Qaeda, Free Syrian Army and ISIS? CNN, the New York Times and the Washington Post. Who spreads fake news stories against Trump? McCain illegally entered Syria yet again on February 23, 2017, right after first planting the seeds of propaganda against Trump, making him out to be a dictator and disabler of the press. When Donald Trump was elected president in November, Russia gave orders for its advisers in Syria to draw up maps of exactly where ISIS is located. Many of the locations are in civilian areas, so it is important to have well-defined maps of ISIS locations. Russia has been successfully conducting air strikes on ISIS training camps, weapons stockpiles and hideouts. They know where ISIS is. There would be nothing wrong with 'talking' to Russia regarding the fight against ISIS. McCain has been one of the biggest promoters of the “Russia propaganda” campaign against Trump; thereby hindering Trump from ‘talking’ to Russia. McCain has also made statements that Russia is committing war crimes in Syria. Russia has not committed war crimes in Syria. If it wasn't for Russia fighting ISIS and al-Qaeda, Syria would have fallen and would now be governed by Islamic Law. 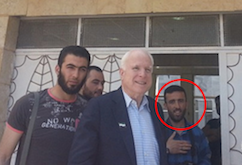 But it is McCain that has been a true supporter of, and has met with, members of al-Qaeda and ISIS in Syria. Is McCain participating in a propaganda ploy to prevent the Trump administration from talking to Russia to join forces to wipe out ISIS? Don't forget, the Islamic State's headquarters is not in Mosul, it is in Raqqa, Syria. In 2011, McCain met with then al-Qaeda members, Abu Bakr al-Baghdadi (who became Caliph of ISIS), Muhammed Nur, Abu Ibrahim and Salim Idris (general in the Free Syrian Army and terrorist who later escaped to Qatar). After all of the atrocities these men committed from 2011-2012 were known, McCain continued to meet with these terrorists. Top left is what the Free Syrian Army does to people who do not follow Islamic Law. Anderson Cooper interviewed Muslim Brotherhood Youth members in Egypt's Tahrir Square in 2011. He chose Muslim Brotherhood members and never average Egyptians, who represented the majority of Egyptians. CNN is very biased, always leaning towards the pro-Islam agenda. Wolf Blitzer later came to Cairo. He, too, was always surrounded by Muslim Brotherhood members, and never interviewed the people or parties who were against the Muslim Brotherhood take over of Egypt. He gave a one-sided view, that of the Muslim Brotherhood, who lied when they said they wanted democracy. As soon as they took power, they began implementing Islamic Law. Time Magazine is a major promoter of the propaganda group, the White Helmets, and also promotes the lies about the Syrian government. Don't forget, it was a TIME magazine reporter who lied and said Trump removed the bust of Martin Luther King from the White House.